This project started when my girlfriend’s dad was searching the internet, unsuccessfully, for a block that would fit his brand new set of extra large steak knives. I took this as an opportunity to try my hand at making a custom one. The story starts much earlier, however. This entire project was created from reclaimed wood taken from some massive old ceiling joists I salvaged from an old art studio in Jersey City that was moving out. The wood seemed to be a softwood like Pine but It’s still unknown what specific wood type it was. Each of these balks were made about 3″ x 1.5″ and ranged from 24″ – ~28″ when they finished up. Some of them had knots and nails, though the carbide 80 T blade barely slowed down going through the nails. (Just a spark and a momentary jolt). NOTE: I don’t recommend going at nails with a wood sawblade unless it is a fairly new carbide blade and it’s completely by accident. Always go over the workpiece with a strong magnet first to identify any metal foreign objects (Nails, Staples, bolts, etc). The nails I encountered were buried too far in the surface to be detected easily. Always wear safety gear, especially when using a radial saw, including goggles, N95 rated dust mask, long sleeves, and heavy work gloves. The pictures here show the initial bulk shape. 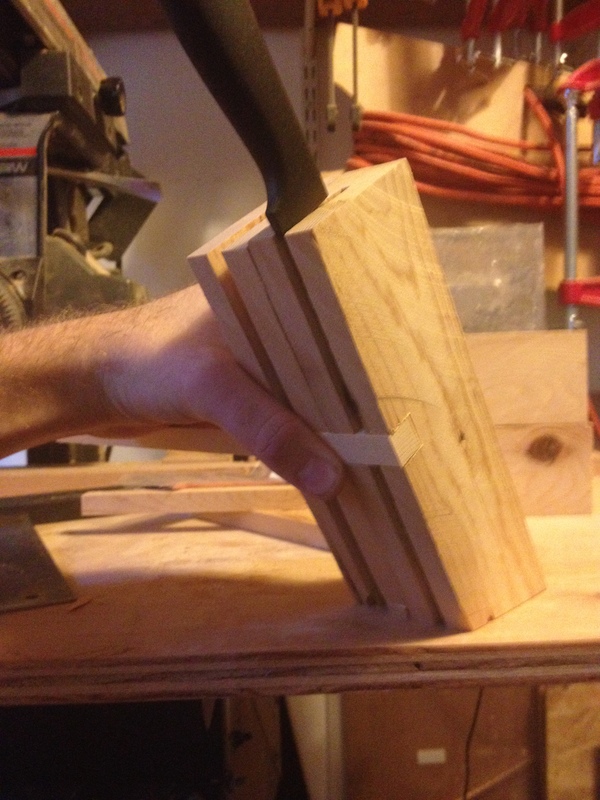 Since i wanted a setting for eight to be possible for one of these blocks, I decided that four boards would need to be arranged in rows of two, and there needed to be some angle on the block for ease of pulling knives in and out. These knives were also 5 – 7/8″ long and over 1″ thick at the widest, so they were fairly large. The initial angle on the bottom was created with a mitre saw at about 30 degrees. This later turned out to be a poor choice and I had to modify the block so the heavy knives would not topple it over. Also, a steeper angle takes up less counter or table space. The plan I had was to cut a slot wide enough for the blade down the center ish of each board and add a few thin strips of wood across the openings of the slots to keep the knives in there. I eventually opted for two braces instead of the one shown to the right. When it worked with one blade, I moved on to make this work for the rest of the blocks. 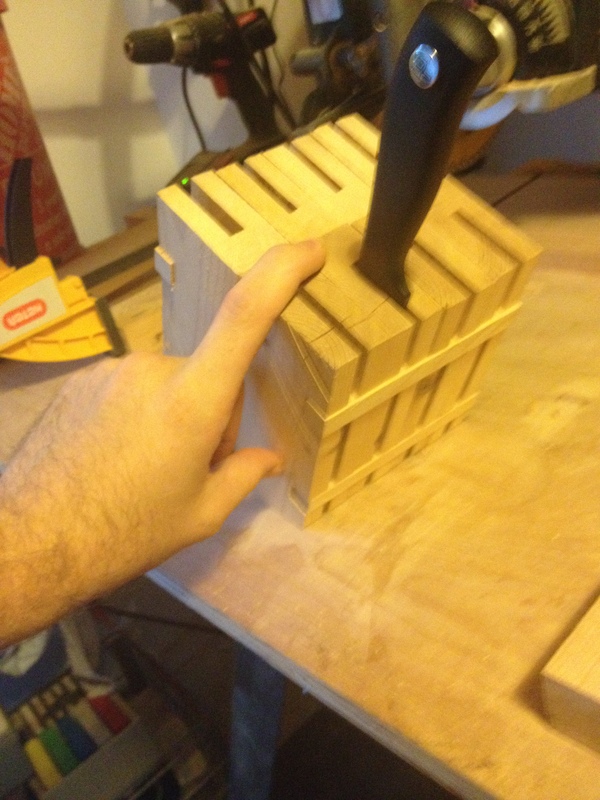 I set up a work stop to get the center of each block. In the end, this wasn’t the greatest solution because some of the thicknesses of these boards varied slightly and since I didn’t have a dado blade and I just flipped the board a few times to widen the slot because the 1/8″ slot didn’t give enough clearance to freely insert and remove these massive blades. The depth of the slots had to be down about 2″ or so to accommodate these wide blades plus the 1/2″ little stopper, which I had to do a lot of passes with a 1/8″ saw blade to achieve. I did all the blocks on each side at once to make them exactly the same size and in the same position. Test fitting the pieces together is a critical stage. 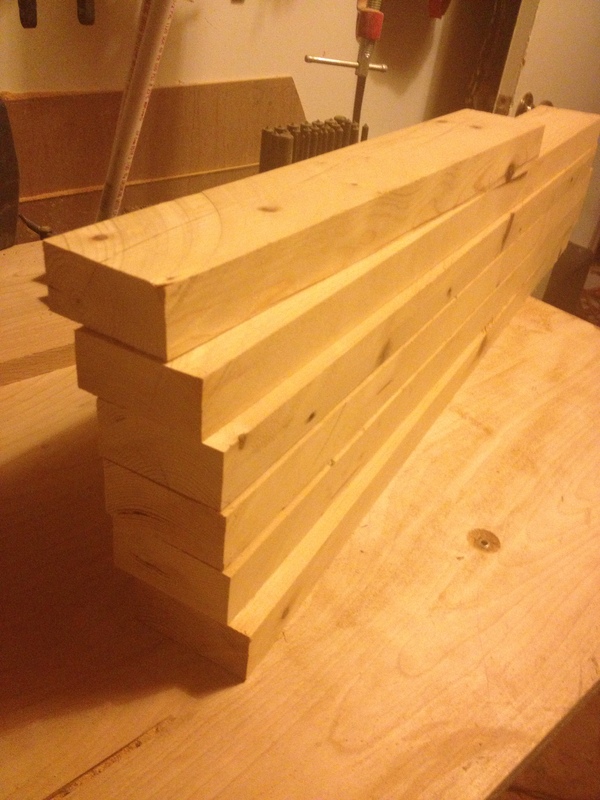 This helps to plan the glue-up, which I did in two stages, clamping each tier of slots together. Then separately in a subsequent stage, I added the small cross-braces. The multi-stage glue-up also allowed me the ability to sand in between stages and clamp everything fully without clamps interfering with other clamps. After Sanding from 60 grit to 80 grit to 100 grit to 120 grit to 150 grit to 220 grit…whew! After the glue-up comes all the sanding. Sanding is a step that’s dreaded by all and yet it’s what makes something professional quality and adds that feel required for good finishes. It’s my opinion finishes on projects separates the good from the great, and the great from the best. I’ve paid attention to try to make good looking finishes an important part of any piece I make, because the only real enemy here is impatience. These things are simple, and they are time consuming, and they are tedious. But the results are usually worth all of that extra concerted effort. I will one day post some notes on wood finishing as a separate post. in this project, I used tung oil because of the color and to use a natural oil. It’s also one finish that can be used on things that may come in contact with food (because it will be holding knives). 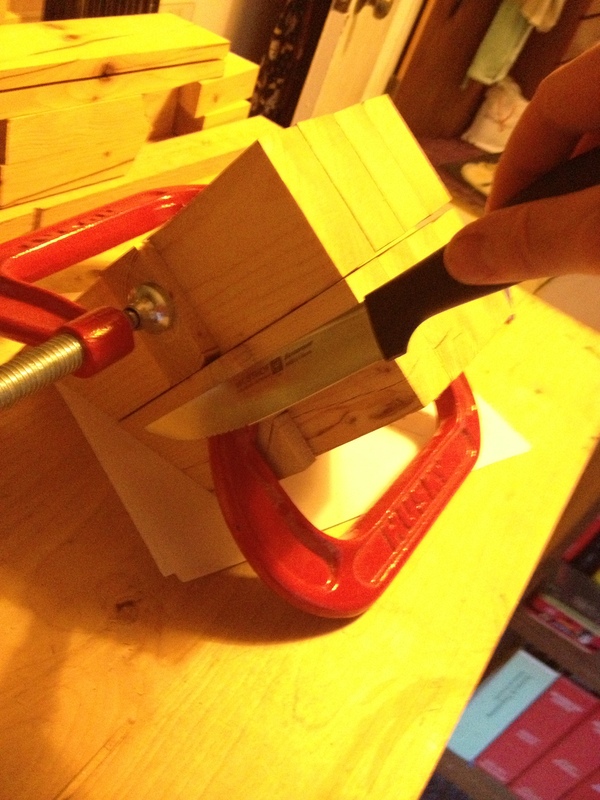 I ultimately had to add little wedges beneath the block to change the angle to make it more upright because of the heavy handles and blades of all eight knives caused the block to tip over. This delayed the project as I went through a couple of variations on how to fix the thing. The final result as pictured here shows the feet. These were scraps cut off the bottoms of the original mitered pieces, and they were screwed and wood glued into place. The knives you may notice have changed too. Because it took me until after Christmas to negotiate all of these changes and fit it into my cutting board workflow, the client had already gotten a better solution (he got a new innovative magnetic block for Christmas). 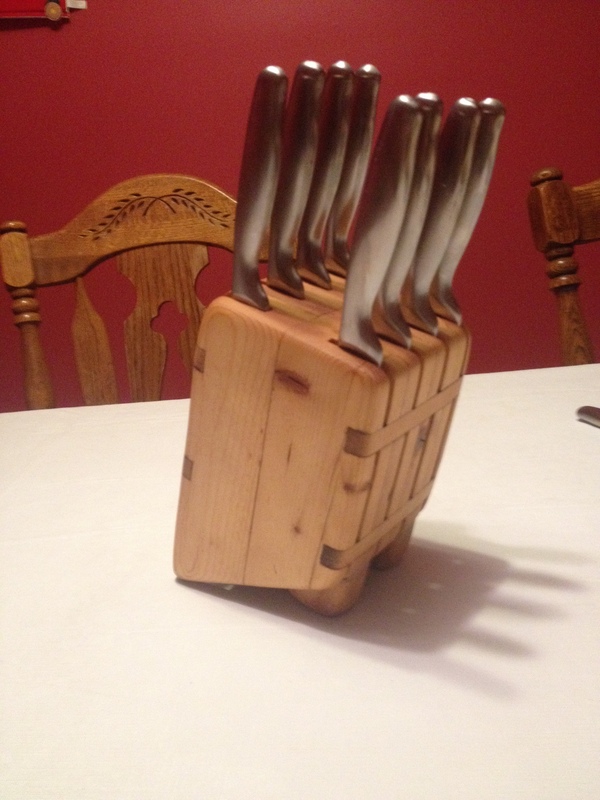 However, this proved to be a nice way to display an old dining room set for parties. In summary, one can build anything from wood, and wood literally grows on (or in?) trees. It can be found anywhere, and most often some good used or junked pieces of wood may still have life in them, for those willing to put in the time and work to salvage them. Usually old furniture is a treasure chest (or table or chair) of solid hardwood that will be cheap or free and have a good story. I hope to make a few more projects from reclaimed wood, but after the saw dust settles, I think my next knife block will use virgin lumber. 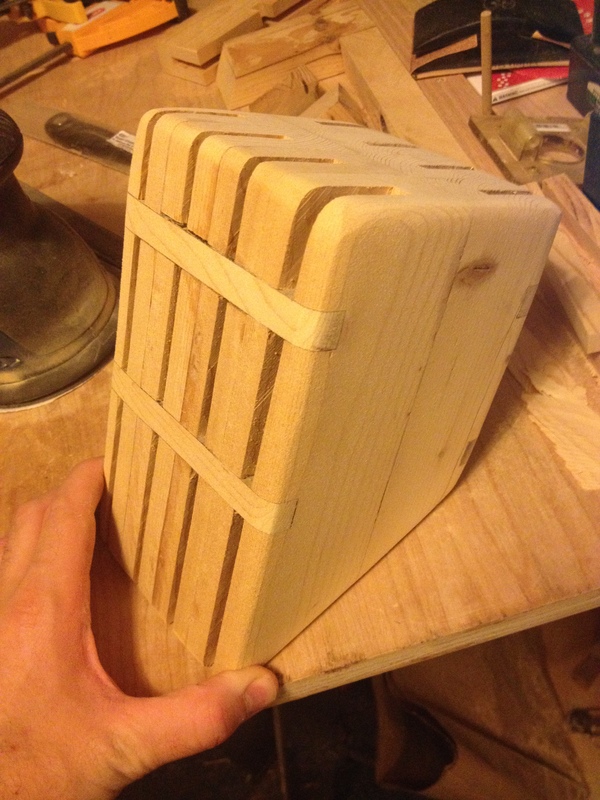 This entry was posted in Uncategorized and tagged Custom Knife Block, Reclaimed wood, steak knives. Bookmark the permalink.